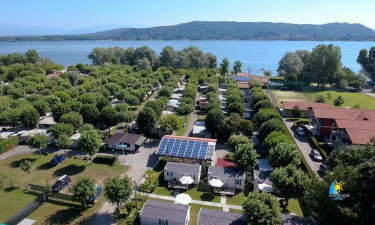 With a delightful location in the Dormelletto Canneto Natural Reserve on Lake Maggiore, Röse Campsite is perfect for a family camping holiday in one of the most beautiful areas of Italy. Camping luxury means excellent facilities and at Röse, whether you're in a mobile home or glamping tent, the camp shop will keep your supplies topped up. If you want to do something other than swim or sunbathe, boats and other water equipment such as paddle boards can be hired from reception. You can also hire bikes for on the campsite and beyond. There are various sports and games facilities around the camp like table tennis. Why choose Röse - Lagio Maggiore? Swimming is an important aspect of any holiday camping site and here there's a choice. Firstly there's the beautiful Lake Maggiore. 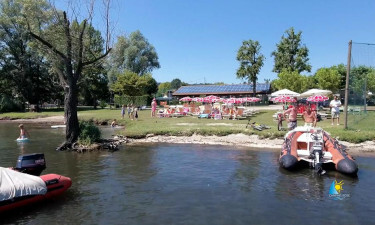 There is direct access to the lake from a small beach right on the campsite surrounded by a lawned area with plenty of sunbeds and parasols. And then new in 2018, there is a swimming pool with two built-in Jacuzzis and changing block. The pool sits in a decked area surrounded by grass so plenty of room for sunbathing. 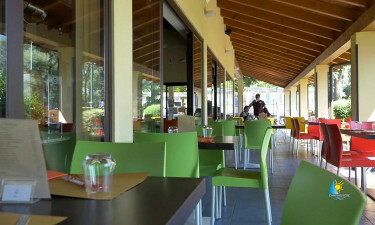 The camp restaurant is full service and offers seating indoors and outdoors as well as a covered terrace area, and there's a separate bar for the grown-ups to unwind in after a long day of entertaining the kids. Secure your next luxury camping holiday by booking through LuxCamp.